Well, it’s been a long time coming. Fans have been looking for the origins of Alice’s silk trench coat, seen in The Twilight Saga: New Moon, for years. 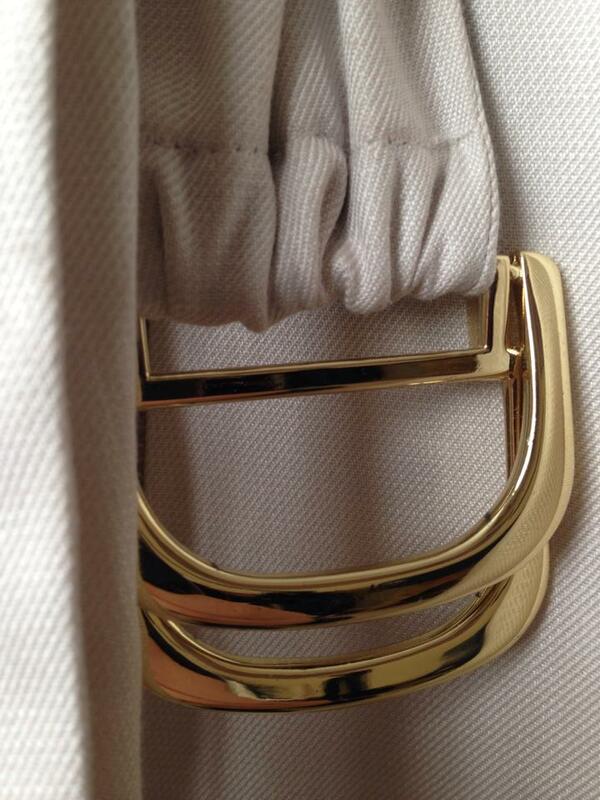 We’ve gone back and forth on brands – is it Burberry? Banana Republic? – and questioned whether it was ever sold at retail or if it was created exclusively for the film. Stacy, guest contributor for Go Ask Alice Cullen and co-creator of Alice Cullen Costuming on Facebook, managed to get her hands on not one but two of Alice’s trenches, so it’s only fitting that she tell the tale of spotting it. My Coup De Gras of Spots! I think it’s a coat with a cape. I found a coat on eBay that looks decently close to it, but the coat that Alice is wearing looks a little too different to be it, though. As for the cape? I have no clue on where to start. Here’s the link to the coat if you want to check it out. The auction has ended, but what Jessica stumbled upon was a similar-looking silk coat from a brand called Shipley & Halmos. 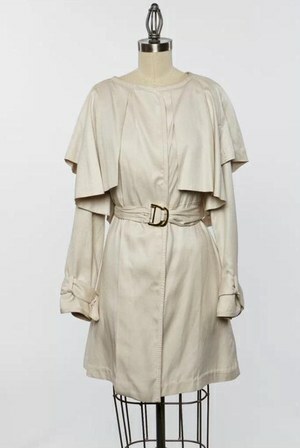 Here is a khaki version of the coat she found, which has some of the same trim and buckle detailing as Alice’s trench. Based on these similarities, everyone at Alice Cullen Costuming got to searching, using search terms like “Shipley & Halmos trench” and “Shipley & Halmos caped trench” on Google. As it turns out, once we had our suspicions about the brand, everything else fell into place in terms of locating the trench pretty quickly. Within minutes of searching, we came upon a black version of the trench – and then the real thing! This was such a huge spot, but it wasn’t easy to actually purchase one. We all had eBay saved searches set and looked at other clothing personal sale sites nearly every day for upwards of a year and a half before we found anything. We absolutely lucked into finding a black one and then a grey one within about a month of each other and haven’t seen anything else since. Sam Shipley and Jeff Halmos started their brand with their first collection of mens and womens clothes in Fall 2008. 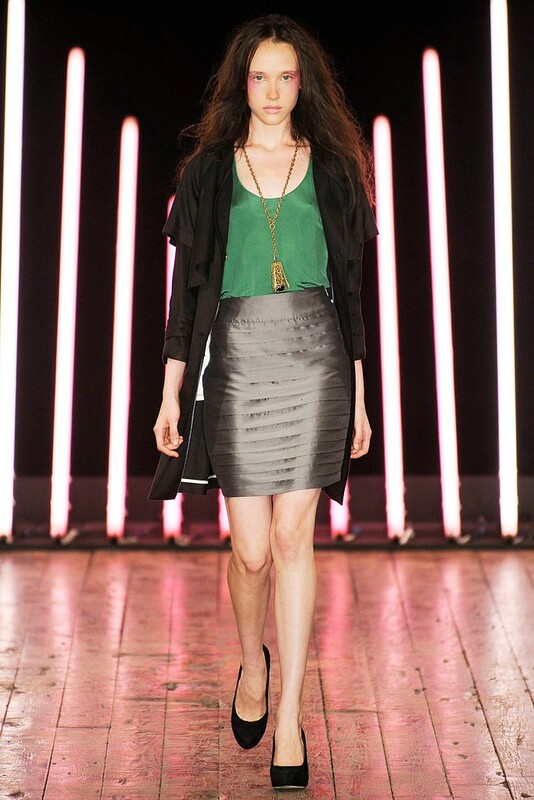 Their Spring 2009 show opened with a look featuring their Bordeaux Trench in Geezer Black (awesome color name!). Shortly after the Spring 2009 collection, they eliminated their women’s line and are now solely a men’s label. 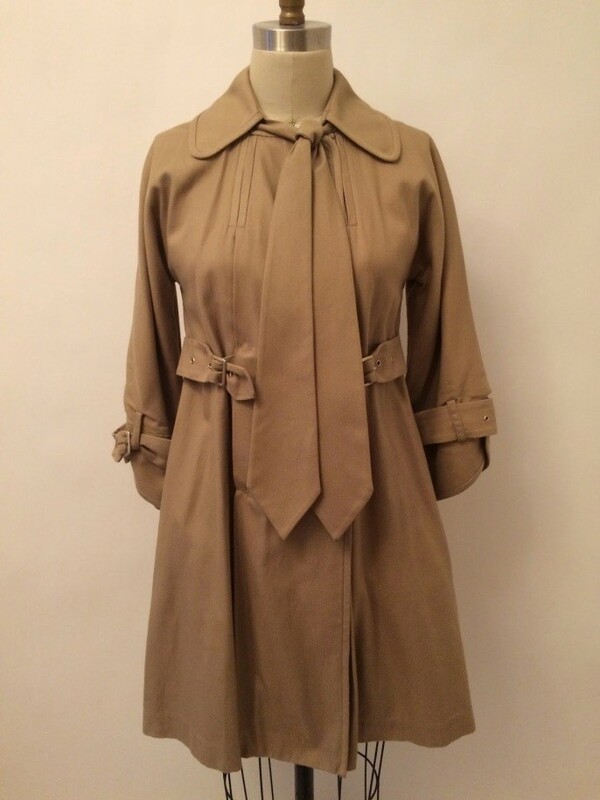 The Bordeaux Trench is a silk/cotton blend double-breasted caped trench with belted waist and buckle cuffs. There are pleats in the rear. It came in the colors Geezer Black and Glass Grey (Alice’s color, which is a grey-ish ivory). The trench originally retailed for $483 at Barney’s, likely where the wardrobe department got theirs, and other retailers. The final sale price at Barney’s was $160. Oddly, the black version of the trench is much easier to locate as a listing on retail sites than the grey version is. The trench is gorgeous in person! It’s a partially-lined silk/cotton twill with some awesome finishes and details that no screen cap from New Moon can do justice. Just take a look at these details and the lovely texture of the fabric! Well, ladies? We want to know: who’s on the hunt for this trench? Are you as in love with it as we are? I don’t own it myself, but I’m looking forward to wearing it at future Twilight events and showing off its beauty – and Stacy’s relentless work – in person. It’s soooooo beautiful. It kills me that they were selling for only $160 for a while! Wish I could get my hands on one but that would probably take forever. It’s crazy that the one little top in the comment led to spotting it!